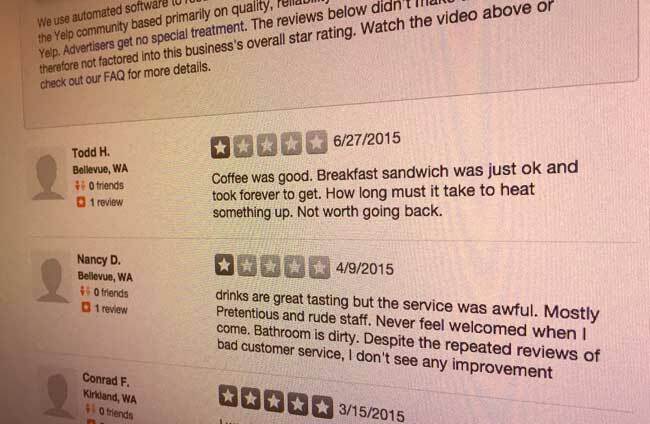 Why is Yelp Filtering My Good Reviews? As a business owner, you need to know that Yelp filters both positive and negative reviews. Yelp has decided that the most credible people on its site are the ones that are using it on a consistent basis. So let's say that you've never posted a review on Yelp, but one day you have such an awful experience (or amazing experience) somewhere that you decided to set up your own Yelp account just so you could let people know. Yelp is likely to treat your review (especially a 1 or 5 star review) as fraudulent and will filter it out. As a business owner, it is also extremely important to note that Yelp is a system that is built so that it won't be "gamed". In other words, Yelp is on the lookout for fake profiles (so don't try to build profiles to make your business sound good). This can hurt you twofold because not only do they block these entries when they find them, but they will also start blocking the good content from real Yelpers, resulting in none of the best reviews about your business being found when your business is searched. We can't fix your filtered reviews, but we can help prevent those bad reviews in the first place, with TalkToTheManager.